If you come to work with us as a driver, you’ll have an introductory day before you go out on the road independently. A number of subjects will be discussed during this day. From hygiene to administration, and from using an on-board computer to general information about working with foodstuffs. Next you’ll take to the road and will be accompanied for at least two days by one of our driver mentors A driver mentor gives practical instructions during the drive, so that you are completely ready to go to work as a driver! Code 95 is a requirement of the Directive on initial qualification. The directive applies to all EU professional drivers professional drivers who work within the EU. We have combined the Code 95 qualification with a senior secondary education (MBO-2) training course. Along with the necessary points for Code 95, all drivers have the opportunity to acquire a professional qualification at MBO Level 2. 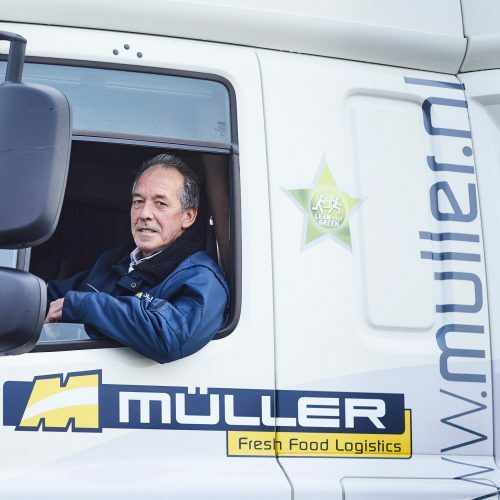 Müller Fresh Food Logistics is a co-founder of the collaboration OT&L (the transport and logistics training centre, Opleidingscentrum Transport en Logistiek). Within the OT&L, a number of transport companies from Rijssen-Holten work together with the ROC in Twente to provide training for young people aged between 15 and 18 as goods transport drivers or logistics employees (MBO, Level 2). A unique aspect of following an MBO course with OT&L is the job guarantee. When the course has been successfully completely, the student is guaranteed a job with one of the companies involved. The traineeships and/or work experience weeks during the course are also arranged. A maximum of 25 students annually can register for an OT&L training course. More information? www.otenl.nl.